St. Anthony was the first Christian to live a life of consecrated solitude. As a hermit in the desert, he lived a long and saintly life that influenced countless people both in his time and for generations thereafter, even to this day. His life had a tremendous impact on the history of early Christianity, which is the basic history of all Christian churches all over the world. The story of his life was written by one of Christianity's most renowned leaders, St. Athanasius the Apostolic who was his disciple and had a very close relationship with him. St. Anthony is generally considered the father of the monastic family. He was born about 251 A.D. of well-to do parents in Coma (Kemn-el-Arouse) in the middle of Egypt . He took this advice as a personal invitation addressed to him by God. He sold about 300 acres of fertile land, gave most of the money to the poor keeping only a little for his sister. Then he placed his sister in the charge of a community of virgins. He was now free to devote his life to asceticism under the guidance of a holy man living near Coma. This was the custom of young ascetics to study under a master in order to learn the principals of spirituality, prayer and fasting. After a while, St. Anthony left on his own for the western desert. He took shelter in an abandoned tomb caved in the side of a mountain. A good friend used to bring him bread and water from time to time. In his solitude he was fighting off the temptations of the flesh and attacks of demons. He was about thirty-five years old when he left his retreat to move to the east bank of the Nile to the " Outer Mountain " at Pispir ( Vista ) where he lived in complete solitude. After twenty years, his reputation attracted many followers who settled near him, and wished to copy his holy life. St. Anthony became their spiritual leader, teaching them constantly by word and example the ascetic life. Five years later, he again retired into solitude in the Inner Mountain ( Mount Qolozum ). As St. Anthony lived in solitude, he was tempted by boredom and discouragement. His soul fell into such weariness and confusion of thought that he began saying, "Lord, I want to be saved but these bad thoughts do not leave me alone; what shall I do? How can I be saved?" After a little while, he began to walk in the open and he saw someone as if it was himself, sitting and working - making mats of palm leaves - and then rising to pray. This was an angel sent by the Lord to teach Anthony how to live in the desert. The angel repeated what he was doing several times until Anthony understood that he had to combine manual work and prayer in order to overcome boredom. Living in solitude (anchoritism) made St. Anthony a spiritual father beyond all others. He escaped from the cares of the world but not from the love for his brothers. Thus, he was obliged to visit Alexandria during the persecution against the Christians, engineered by Maximin Daja in 316. He spent his time ministering to the oppressed and afflicted in prisons. When the persecution ended, he returned to his cell to be a daily martyr to his conscience, fighting always the battles of his faith. Once again, he visited Alexandria to support Pope Athanasius against the heresy of Arius in 352. Pagans and Christians alike rushed tout to greet the holy old man, but he soon returned to the desert, for he felt like a fish out of the water. St. Anthony founded no monastery. His rule consisted simply of prayers and manual work. He told his disciples that just as Christ was a carpenter and Paul was a tent maker, they also had to keep their hands busy to escape temptations. He also assigned a uniform to the monks. This was a garb of white linen reaching below the knees. A wide thick belt of leather helped the monk to keep erect. This pattern is seen today in many monastic orders all over the world. From every part of the world, people came to him, even to the innermost part of the desert, seeking cures of the body, mind, and soul; and as they did at Pispir, monks came to him for his sympathy and practical advice. Once St. Athanasius had invited Anthony to Alexandria and they were joined by Didymus, a man of great learning who had lost his eyesight. The conversation turned to the Holy Scriptures, and Anthony could not help admiring the blind man's ability and praised his insight. Then he said, "You don't regret the loss of your eyes, do you?" At first, Didymus was reluctant to answer, but when the question was repeated, he frankly admitted that his blindness was a great grief to him. Whereupon, Anthony said, "I am surprised that a wise man like you should grief at the loss of a physical organ which he shares with everyone, and not rejoice rather in having the gift which only saints and apostles have been thought worthy." In 356 A.D., St. Anthony died at the age of one hundred and five, but his place of burial was near revealed by the two monks, Marcarius and Amatas, who buried him. His monastery produced many great saints including SS. Hilarion of Gaza , Macarius of Scete, Amoun of Nitria and Paul the Simple Intimacy with God made St. Anthony as tenderhearted as the Master he served. Consequently, his influence extended beyond his lifetime, and the Universal Church still reveres him as one of the great saints. His life was written by St. Athanasius while he was in Rome , and it was very influential in spreading the ideas of monasticism throughout the Christian world. According to St. Athanasius, St. Anthony was a man of "divine wisdom" and of grace, although he never learned to read or write. Today, a monastery bearing the name of St. Anthony stands in the eastern desert. The cave, in which the saint spent most of his life, is located beside it. Many monks live there, and many people from all walks of life visit it every day. 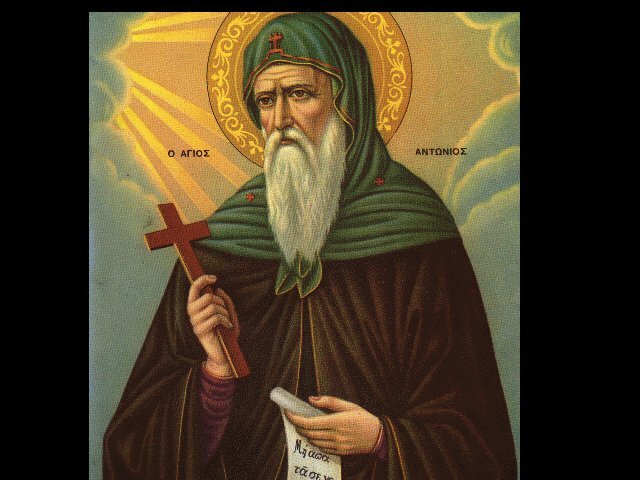 May the prayers and supplications of this great Saint Anthony, the Father of the Monks, be with us. Amen.